There's a theory that before entering a body of water to fish, a flock of penguins will push one of their own into the water. If a predator doesn't attack, the others safely enter. Radio stations are a lot like penguins. We travel in packs, doing the same sort of things, following the same music charts and watching each other intently. Only, instead of being pushed, some jump into the water on their own, deep into the pool of risk. Risk can bring great rewards with some things. If you are truly an innovator, there's great success in developing a great idea. But truly successful stations don't take careless risks; they formulate their moves based upon past success and a prediction of the future. If you're an adult-oriented station, chances are, the majority of your audience does not place great value on new music. Instead, they prefer music they know, and like. If you're watching the other "penguin" stations, you might be tempted to jump into the water. Before you do, examine your motives. the other penguins into the pool? If you're not sure on new music, don't dive. Be confident in your strategy, and observe. There's nothing wrong with watching the "test penguins" in your market to see what works. 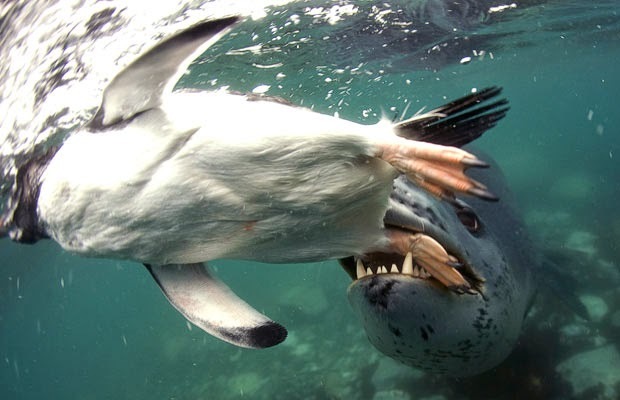 And when a competitor gets swallowed up by a leopard seal, you might not even notice. Because you, wise one, are intently focused on your listener, instead of what everyone else is doing.